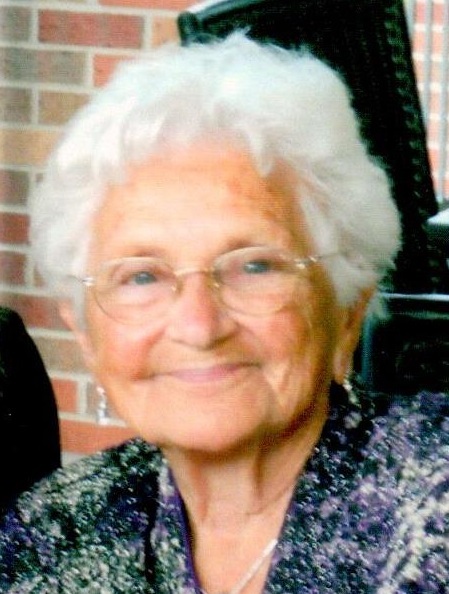 Alice Frances Theis, age 94, of Winona, passed away on Saturday, January 26, 2019, at her home. She was born on January 13, 1925, in Winona, to Frank and Frances (Striegel) Took, and was a graduate of Cathedral High School. She was employed with Jones and Kroger in their bindery department, where she met her husband, Frank. Alice and Frank were married on June 22, 1946, at St. Joseph’s Catholic Church in Winona, and he preceded her in death on November 11, 1984. Alice loved to read, quilt, knit, and travel. Alice enjoyed riding her bike around town well into her 80's, and she was also very proud of being able to run the bases at a Twins game at age 82. She was a member of St. John Nepomucene Church where she was active with the church quilters, Harvest House, and Catholic Daughters. She also enjoyed working in her backyard and growing beautiful flowers. She will be remembered for her sugar cookies for every holiday, sitting on her front porch watching the Minnesota Twins, and waving to everyone who passed by. She loved shopping with her daughters and was always willing to help her sons at their print shop whenever needed. Alice’s greatest gifts were her children, grandchildren, and great-grandchildren. She especially cherished spending every holiday with them, watching all their school and sports programs, sleepovers, and baking sugar cookies, popcorn balls, and mints for every celebration. She will be deeply missed by all those who loved her. Alice is lovingly survived by her children: Cathy (Greg) Olson, Chris (Dave) Babler, Steve (Nancy) Theis, and Ron (Judy) Theis; grandchildren: Eric (Sarah) Babler, Adam (Amelia) Babler, Jeff Theis, Paul Theis, Alex (Jenn) Theis, Gretchen (Nick Weber) Theis, Aaron Theis, and Shelby Theis; great-grandchildren: Aubrie Babler, Brodie Babler, and Landen Haney; sister-in-law: Dorothy Theis; nieces: Jean Theis and Carol Tarras; nephew: Rick (Cathy) Theis; as well as other relatives and friends. She was preceded in death by her parents; husband, Frank; brother: Frank Took; brothers-in-law: John Theis and Robert Theis; sisters-in-law: Betty Took, Henrietta Theis and Anna Theis; and a niece: Mary Ann Theis. Visitation will be held from 11 AM until 12:45 PM on Friday, February 1, 2019, at St. John Nepomucene Church, 560 East Broadway in Winona, where a Mass of Christian Burial will be offered at 1 PM. The Very Reverend Patrick Arens will officiate. Alice will be laid to rest in St. Mary’s Cemetery. Pallbearers will be all of Alice’s grandchildren: Eric Babler, Adam Babler, Jeff Theis, Paul Theis, Alex Theis, Gretchen Theis, Aaron Theis, and Shelby Theis. The family respectfully asks that memorials be directed to St. John Nepomucene Church or to Winona Health Hospice. Online condolences or memories may be left for Alice’s family at www.watkowski-mulyck.com.